This paper is the fifth of a series of papers aiming at showing the insights on worldwide industry offered by our Industry & Strategies database. Previous papers offer information about the United States, the European Union, worldwide R&D and Africa. 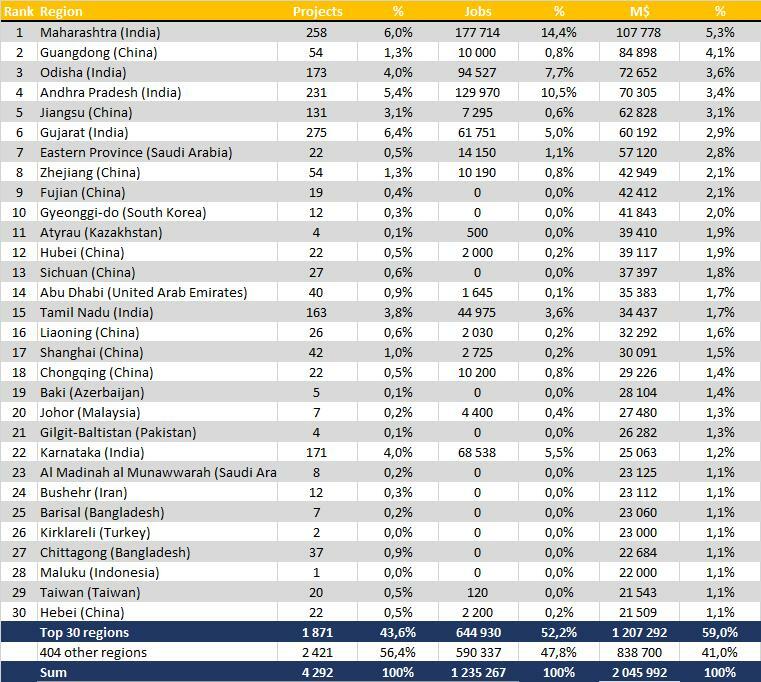 From january 2016 to april 2018, we tracked 4 292 investments announced in Asia, for $2 045 billion and 1 238 267 jobs. In the database, each information is described precisely across 30 quantitative and qualitative fields. The tables below synthetize the available data alongside different criteria. 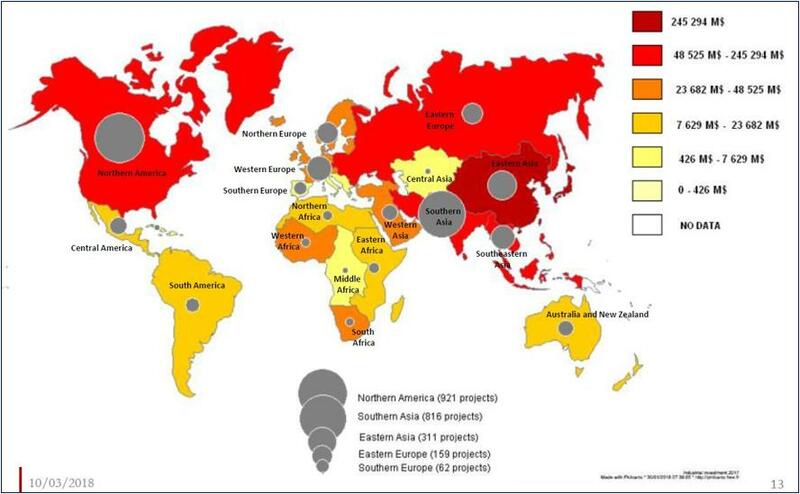 Among the main economic areas below, Asia ranks first by amount invested, number of projects invested and jobs created. The average amount invested by project is 13% higher in Asia than the global average. 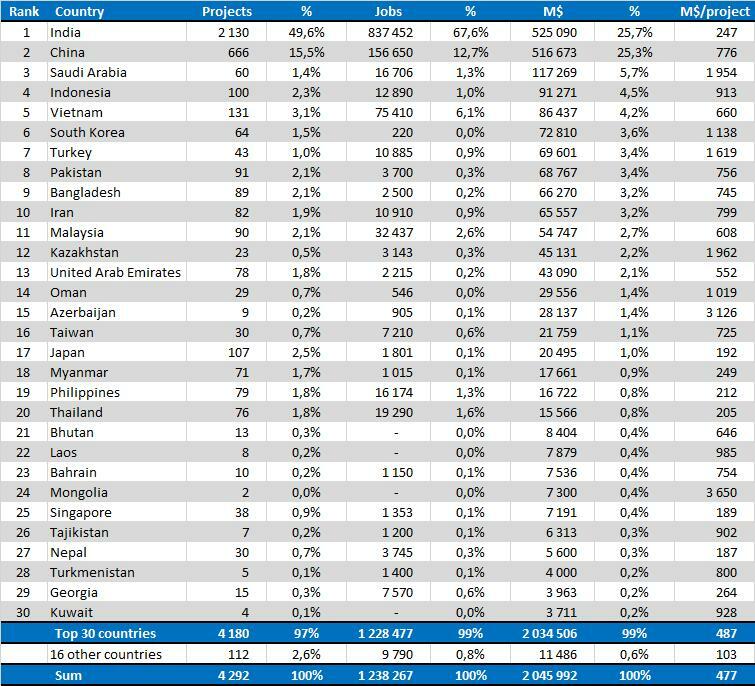 Tracking information throughout a list of languages that does not include Chinese, yet, we probably underestimate investment in China, as only the biggest investments are reported by English speaking media. In an appendix, we try to estimate the degree of this under-evaluation. All following comments must then be understood keeping this point in mind. India and China altogether make slightly more than half of the amount invested in Asia, and two thirds of the number of projects tracked. 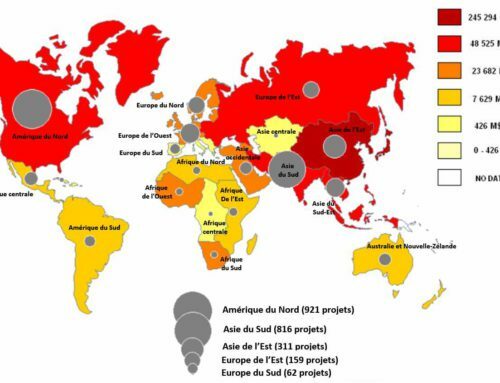 In number of projects, Vietnam and Japan rank third and fourth, but Saudi Arabia and Indonesia replace them by amount invested – Saudi Arabia having one of the highest amount invested by project. by number of projects, jobs created, and amounts invested. 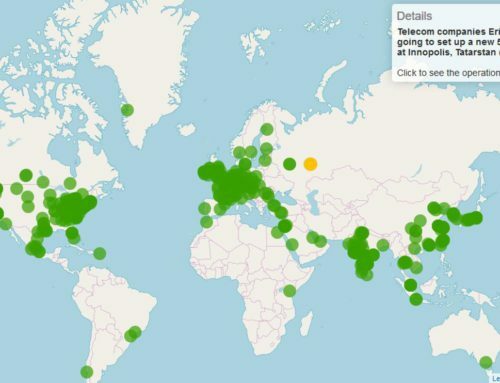 Among the 30 top regions ranked by amount invested (out of 434 regions in which investments have been tracked), 10 are in China, 6 are in India, 2 in Saudi Arabia and Bangladesh and ten countries have one region in this ranking: South Korea, Kazakhstan, United Arab Emirates, Azerbaidjan, Malaysia, Pakistan, Iran, Turkey, Indonesia and Taiwan. 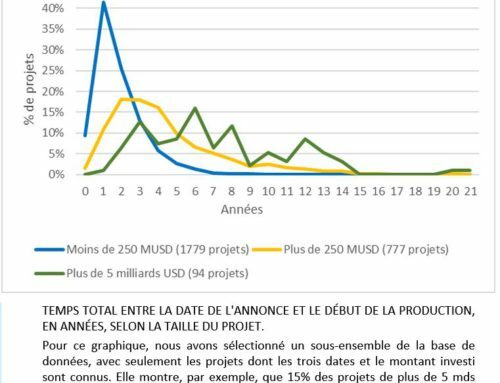 by number of projects, jobs created and amounts invested. By city and by amount invested, Penukanda comes first, followed by Petaling Jaya and Chongqing. 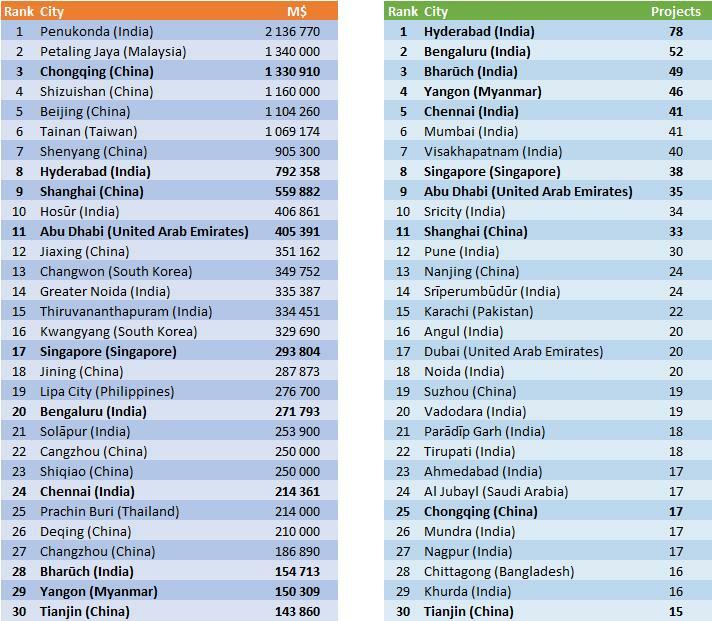 By number of projects, we find three Indian cities, Hyderabad, Bengaluru and Bharuch, with cities from other countries in Myanmar (Yangon), Singapore, Abu Dhabi, and Shanghai as first Chinese city. Asia is the geographical area where the share of endogenous (coming from outside of Asia) investments is the highest – with 93% of investments coming from Asia (Data from our 2017 report on industrial investment). 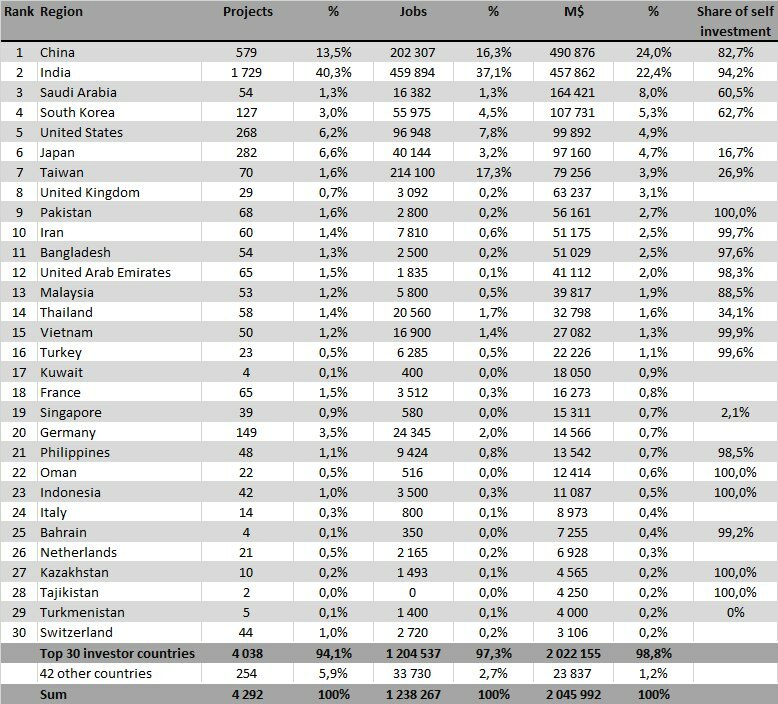 For each Asian country, in the following table, we added in the last column the share of domestic investment in the overall amount of investment from domestic companies (the first line of the table indicates that Chinese companies announced 579 investment projects, for $490 billion, 82,7% of which invested in China). 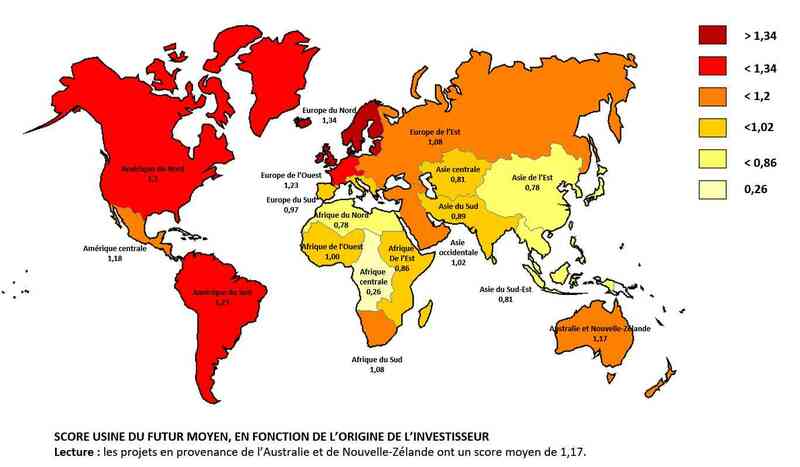 The United States are the first investor outside the zone, followed by the United Kingdom, Kuwait, France and Germany. A spectacular result is the very low share of Japanese investments going to Japan itself: 16,7%. In Asia, investments by state owned companies is important: 8% of projects and 18% of amount invested are undertaken by state owned companies (in the rest of the world, it is 5% of projects and 10% of amounts invested). We also find state owned holdings or funds, such as Chinese Everbright, at the top positions in our ranking. By amount invested, BP, Exxon and Chevron are the first three foreign investors. By number of projects Amazon, Cargill and the Canadian Fairfax financial altogether announced 57 projects. Those 30 top investors represent 27% of overall investment in Asia. 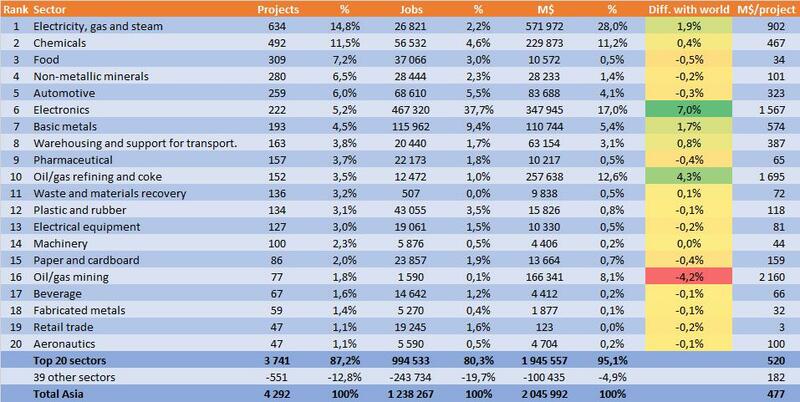 by number of projects, jobs created and amounts invested, ranked by number of projects. 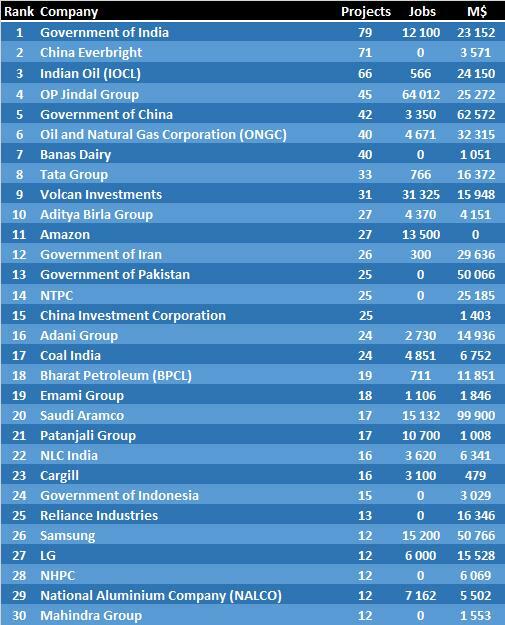 by number of projects, jobs created and amounts invested, ranked by amount invested. Detail of the ten top investments by state owned Chinese companies. Our database characterizes the main type of activity for each project. Asia distinguishes itself clearly by a share of manufacturing which, at 53,4% of amounts invested, is 10% higher than world average, and mining and quarrying activities which are 12% lower than world average. The amount invested in manufacturing, $1.092 billion, make 67% of world manufacturing investment. Asia is clearly the manufacturing center of the world. by number of projects, jobs created and amounts, by type of activity. Last column: average amount invested by project. The electronics sector is the most over-represented in the top sectors. In fact, the $347 billion of investment in electronics make 92% of world investment in electronics. Investments by sector in Asia, 2016-2018, in number of projects, jobs and amount invested. 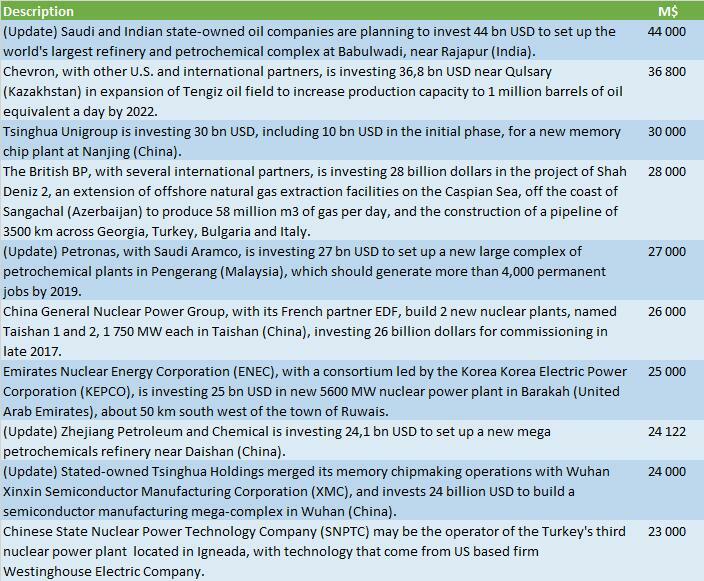 The following table lists the ten biggest investments announced since january 2016 (we recorded in our database some projects that had been announced before but were discussed again since January 2016). Eight of these projects are in the energy sector, the other two are in electronics. Each criterion is ranked 0 (no mention in the news describing the investment), 1 (some measures described) or 2 (quantitative objectives defined for the criterion considered or insistence on it). Adding those 0-2 scores over six criteria gives a total Industry of the Future score which varies from 0 to 12. 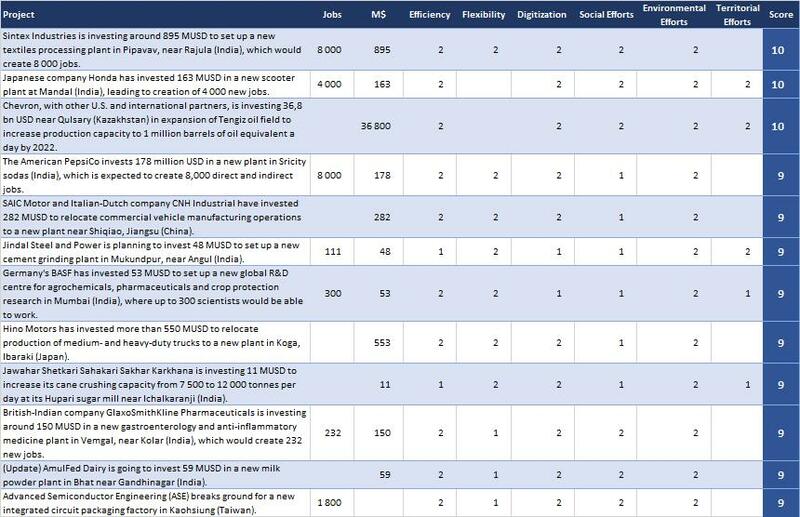 There are, listed in the following table, the 12 projects with a score of 9 or more. 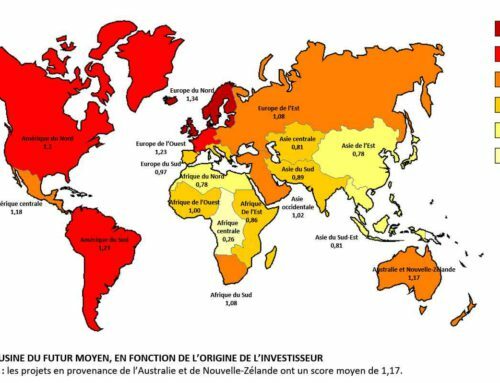 The average score in Asia is 0,89, lower than the average global score (1,03). There is no apparent link between the factory of the future score and the size of the projects. The average score for FDI investments (0,86) is lower than the average domestic score (0,91). Best scored projects for factory of the future criteria. 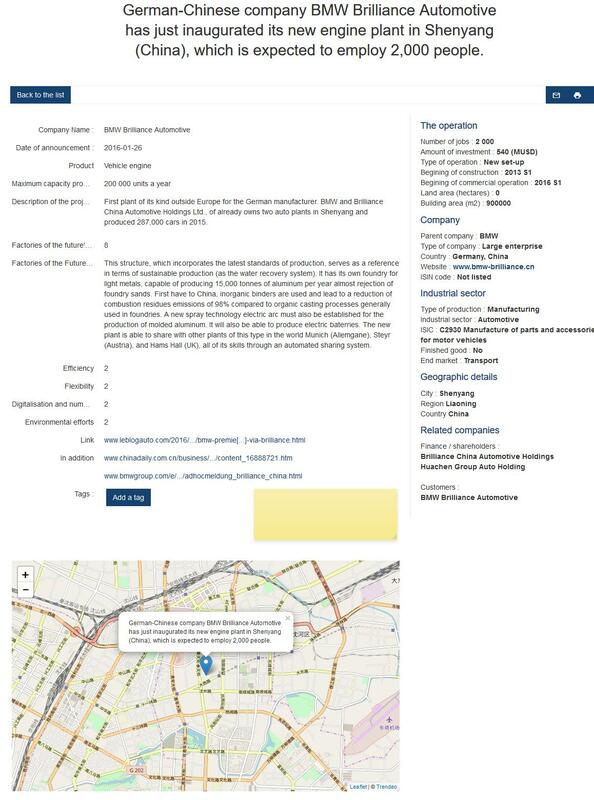 Each operation is described on a dedicated page in the database, including information such as production capacity. 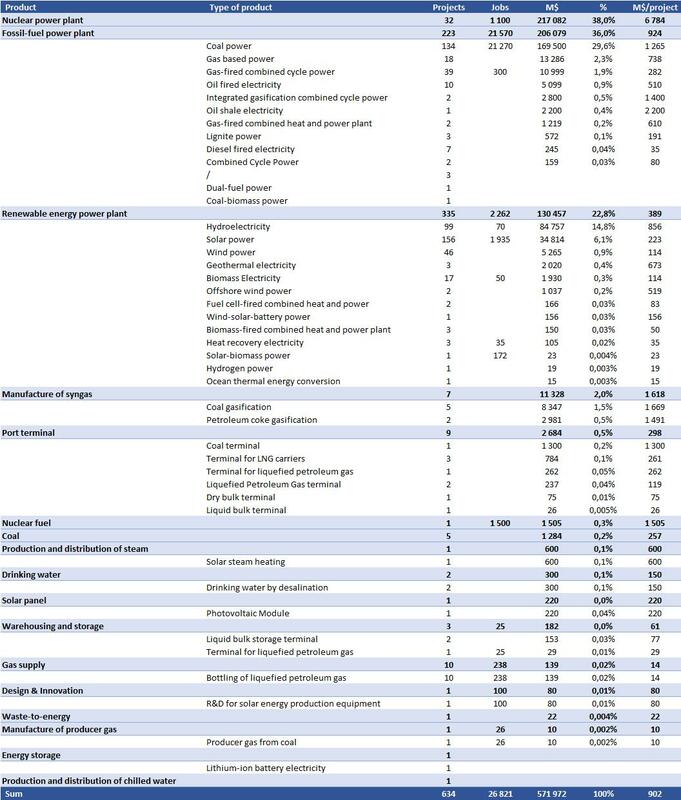 The next table shows the detail by product and type of products for the energy sector. 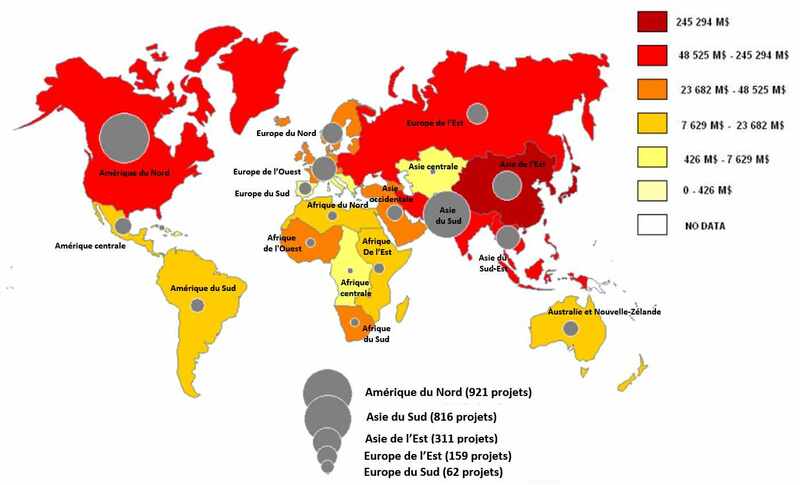 The nuclear sector and fossil fuel power plants are roughly equivalent, with 76% of investments in the sector. With 23%, the renewables come in third position, with hydroelectricity much more present than solar and wind. 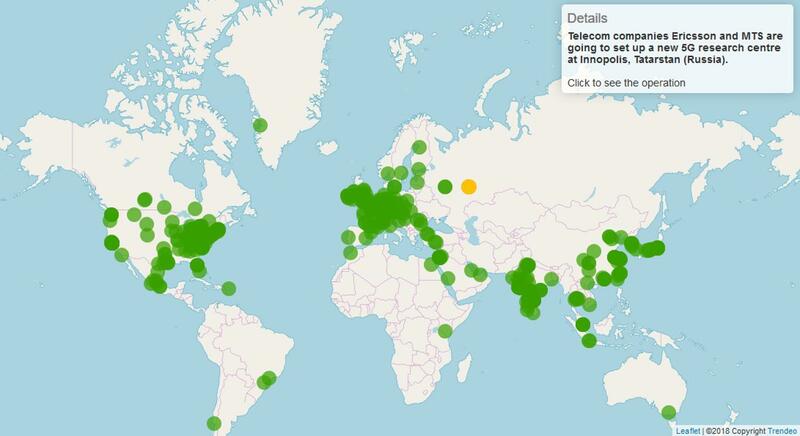 China is under-represented in our database, by which amount? In our results, readers will find that investment in India is 2% higher than in China. This does not seem coherent with the fact that Chinese GDP is 2,4 times higher than India’s, and China’s GDP share of industry is also higher than in India – by ten points. 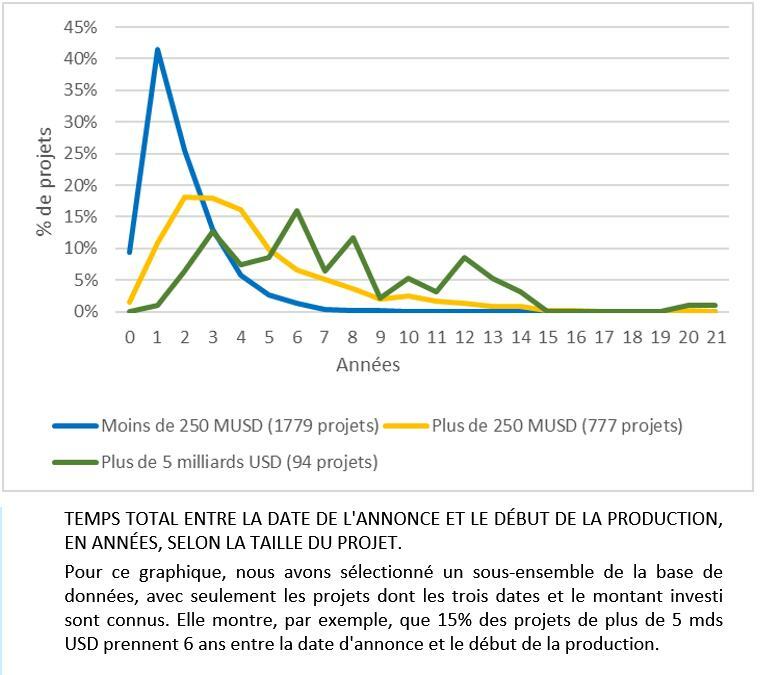 As the following chart shows, for each category of investment, by amount, we have more projects detected in India, except when amounts invested become closer to the $2,5 billion range. Most probably, the projects in China under this size are not reported by English speaking media, only in the Chinese media. We think that working in Chinese will help us, in the near future, to close the gap of information between China and India. It must also be taken into account the fact that the IMF forecasts a higher growth in India than in China in 2018, which could lead to a Chinese lead over India lower than expected. (meaning, from column 3: there are in our database 100 investments between $10 M and $50 M in China, and 600 in India). This document is a short synthesis of the data available in the Industries & Strategies database about investments in Asia. 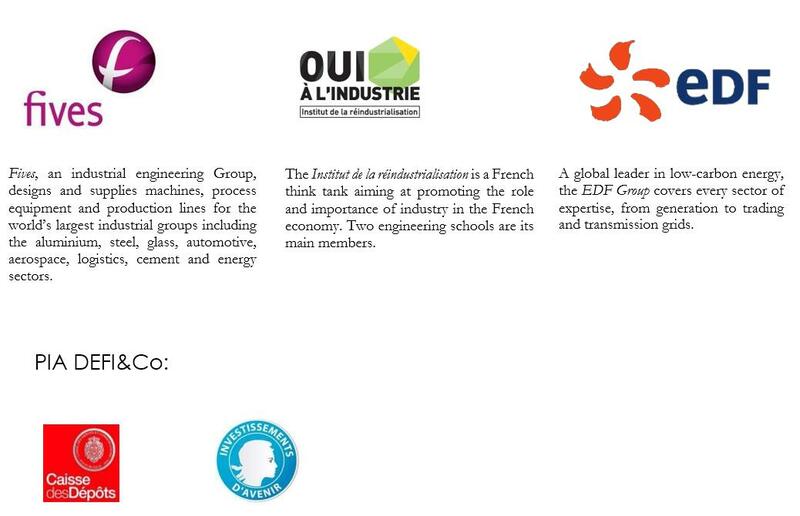 The Industries & Strategies database has been made possible by our sponsors: Fives, the Institut de la Réindustrialisation, EDF and Defi&Co (Programme d’investissement d’avenir (PIA), managed by Caisse des Dépôts et Consignations). 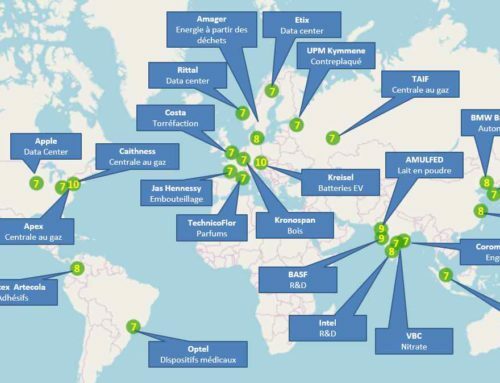 L’Usine du Futur, quels secteurs et par quels pays ?